Tough, squat little acorn squash are a chore to peel, so they’re best cut in half and roasted to soften the tasty, nutty flesh, then you can simply scoop it all out to make a soup, pasta filling (for example, lasagne or tortellini) or stuffing. I stirred mine into a sort of risotto of mushroom, rosemary and brown rice, popped this back into the shells and topped with grated Parmesan to make an earthy, comforting supper dish for two people. My sides were an attempt jazz up some veg that needed to be used up, but they proved surprisingly delicious: carrots roasted in maple syrup and cabbage sautéed with garlic and cumin. Smells (and tastes) like autumn. Half 2 squash, sprinkle with salt, pepper and olive oil, and place with cut-ends facing down on a baking sheet. Cover tightly with tin foil and roast at 230 degrees Celsius/gas mark 8 for 30 minutes, or until the orange flesh is soft enough to scoop out. Slice carrots into batons, place in a roasting tin and toss with olive oil, salt and maple syrup, ensuring they’re evenly coated. These can roast alongside your squash. To make the stuffing, finely chop one onion and sweat in olive oil over a low heat for five minutes until soft and translucent. Add 200g mushrooms, diced, and 1 tsp dried rosemary (or thyme) and cook for another five minutes. Pour in 2 cups of vegetable stock and 1 cup of brown rice. Bring to the boil then simmer for 20 minutes, adding more water if necessary, until the rice is cooked and liquid is absorbed. Season to taste. While the rice is cooking, shred 1/2 cabbage and sauté in a wok or pan with a glug of olive oil, 1 finely chopped bulb of garlic and 1 tsp ground cumin for five minutes. Remove squash from the oven. 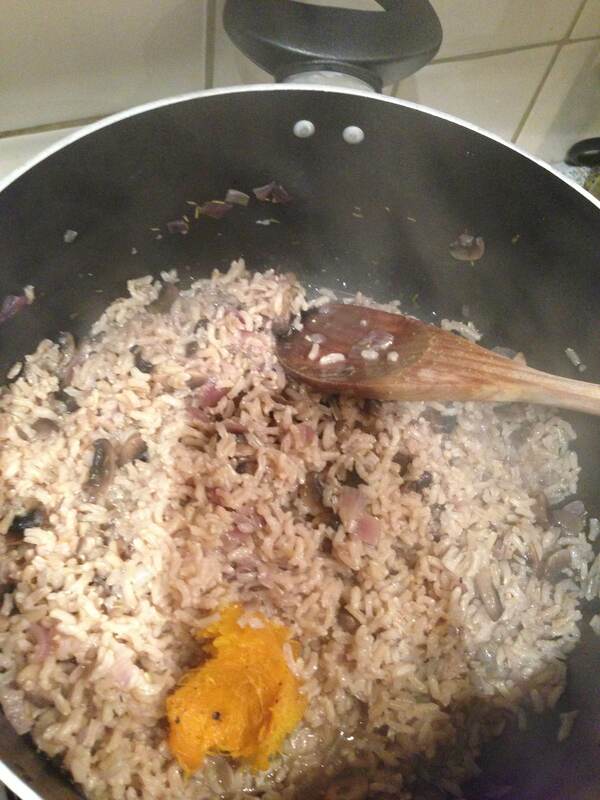 Scoop out the flesh and stir this into the rice mixture. 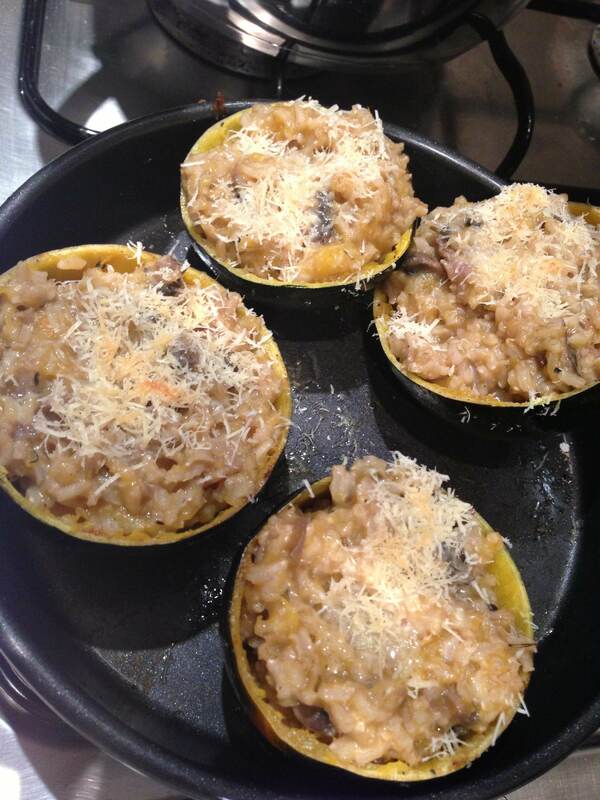 Spoon into the squash shells and sprinkle over the grated Parmesan. Place under a hot grill for 5 minutes, until the cheese is browning and melted. Serve with the cabbage and carrots. 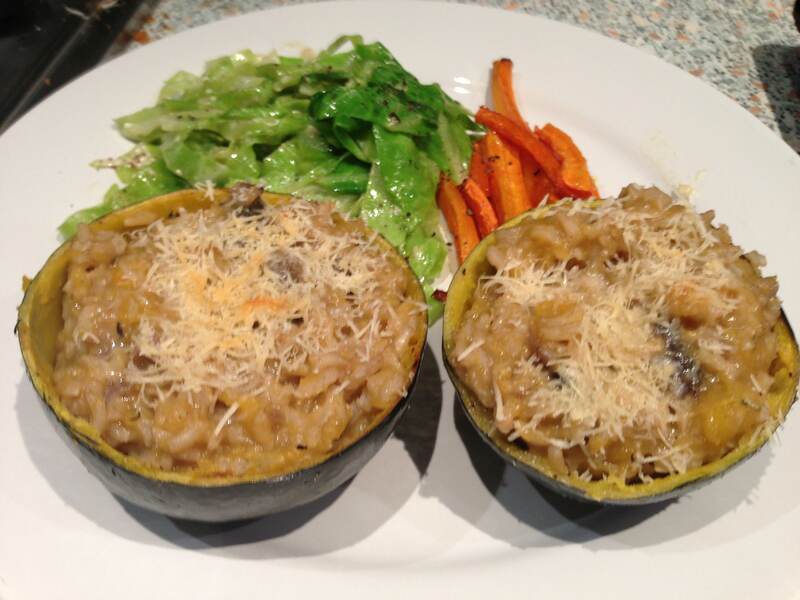 This entry was posted in Rice & Risotto, Vegetables & Sides, Vegetarian and tagged autumn, Cabbage, dinner, mushroom, recipe, rice, Roasting, squash, stuffed, vegetable. Bookmark the permalink.